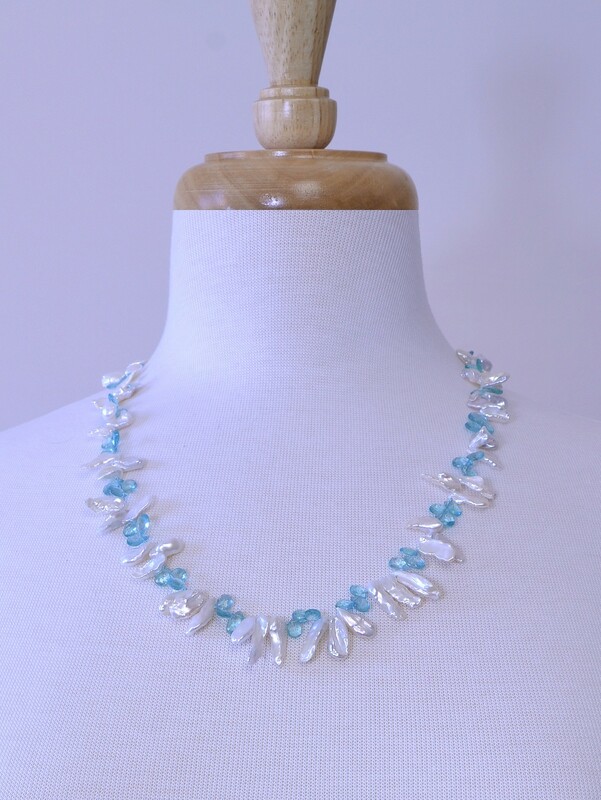 A simple composition of bright apatite briolettes and freshwater pearls for your enjoyment! 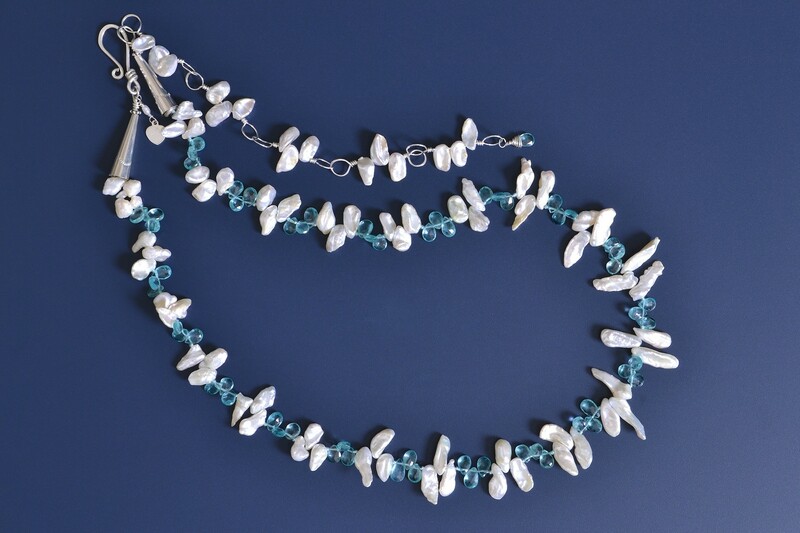 Interspersing colorful gemstones with white pearls seems to amplify each in a pleasing way. The pearls serve as a sort of backdrop, showing off the color nicely. In their introduction to Apatite, Simmons and Ahsian mention that individual crystals of Apatite found in Renfrew, Ontario, Canada can weigh up to 200 kilos! Wouldn't it be spectacular to find or even see a 200 kilo blue crystal? 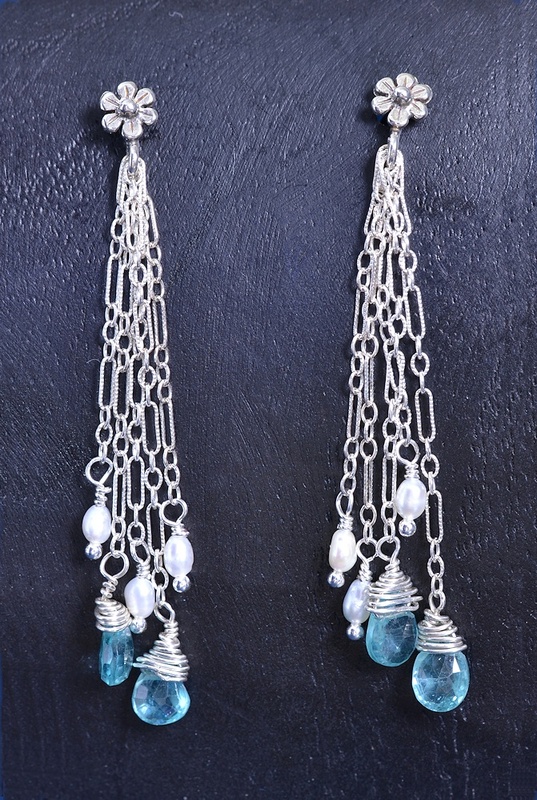 Apatite is actually a group or admixture of phosphate minerals. We could argue here about whether or not it should be considered a mineral or a rock for various reasons including the fact that it is one of a few minerals produced by (as well as used by) biological micro-environmental systems. It is so cool the way ectomycorrhizal fungi can release elements from Apatite which presumably benefit the trees these fungi exist in symbiotic relationships with. (<--- ending a sentence with a preposition isn't a sin though it's really hard for me to do.) Apatite teaches something of the power of Teaming with Microbes and you may never dig in your garden soil againafter reading that book!! Apatite is interesting for many reasons. For example, it is present in the moon rocks collected during the Apollo program. When these were re-analyzed in 2010, trapped water was found in the Apatite as hydroxl which led scientists to revise the estimates of water on the lunar surface upward to 100 times higher than previous estimates. Turning to our metaphysical texts, Hall (below) describes how Apatite works with the pineal gland and she notes that an accumulation of Fluorite (Calcium Fluoride) in the pineal gland has a detrimental effect on sleep patterns and causes sexual maturation problems which Apatite can clear (BTW, do not get the impression that she is suggesting you eat the beads from this necklace! It is the crystal vibration that does the healing work). While I must defer to Judy Hall on the beneficial effects of Apatite for these conditions, she isn't making up the negative effects of Fluoride on the pineal gland. The research on the effects of fluoride accumulation in the pineal gland is referenced on the Fluoride Action Network's 50-reasons page, a list which raises many concerns about drinking fluoridated water and at the end provides links to arguments in favor and arguments against fluoridation. Many alternative health experts have been warning for years about the negative health impacts of the Fluoride added to the water supply (often called "forced medication" by opponents) while the CDC maintains water fluoridation is "one of 10 great public health achievements of the 20th century" according to Wiki. It is all very confusing for the average person to figure out. Is Fluoride neurotoxic as some assert? Are babies in danger of overdosing on it from municipal water supplies as the American Dental Association concluded in their 2010 study? It is noteworthy that pharmaceutical grade fluoride is not usually added to our drinking water. Instead industrial waste from phosphate fertilizer industry scrubbers is used. These wastes may include impurities like arsenic, a known human carcinogen. One might conclude that this takes the elite's "Let them eat cake!" mentality to a whole new, twisted level, or on the other hand assume that the CDC knows what is best for us. Sorry to digress, but many of my friends seem unaware that there are serious concerns about the safety of fluoridation. Oh dear, that was a disturbing discussion all stimulated by such a gorgeous crystal. To return to a happier thought, Ahsian agrees with Hall observing that blue Apatite clears and stimulates the third-eye chakra. Simmons mentions its support of lucid dreaming. I hope you will enjoy wearing this lovely necklace and hope it brings any healing you may need. And perhaps we will meet in dreaming!